Browse the education sessions scheduled for the American Telemedicine Association's annual conference and expo in New Orleans next month, and you'll notice that many of them are geared toward elderly patients, home-based care and aging in place. There's one session titled, "From Preventative To Proactive: How Partnerships are Reimagining Telehealth's Role In Healthy Aging." There's another about "inspired aging and virtual care transformation" and another touting home care successes thanks to a "virtual care-enabled remote monitoring program." None of that is a coincidence, of course. As the "Silver Tsunami" swells, with more than 75 million Baby Boomers set to avail themselves of their Medicare benefits and put strain on an already overstretched health system, telehealth and remote care technologies will be key to helping deliver appropriate care to these aging patients while keeping costs under control. Whether deployed as an affordable means of after-hours medical coverage at skilled nursing facilities, or as intuitive voice activated home tools to help with remote monitoring and distance-based consults, telehealth is reaching maturation at just the moment it's needed most. We've been talking about it for decades, after all. ATA was founded way back in 1993. But only in recent years have a confluence of trends related to regulations, reimbursement, technology, workforce and workflow come together to finally give telehealth the momentum so many have long felt it deserved. It's the "overnight success story that was 30 years in the making." Grant Chamberlain, managing director in the corporate finance healthcare practice at Ziegler, has long experience of telehealth-focused investments. He's advised major health systems (Baylor Health, Cedars-Sinai, Sharp) and vendors such as AirStrip, MDLive and Voalte. He's also director at the ATA and serves on the board of the not-for-profit MAVEN Project, which helps deliver care to underserved populations with volunteer physicians affiliated with Harvard, Yale, Stanford, UCLA and others. "I think we're now broadly in the middle innings, the fourth or fifth inning, of the evolution of a 30-year sector," he said. But when it comes to the senior living space, "we're probably only in the first or second innings of adoption and utility of solutions in that space." "The beauty of where we are now is we've had an increasing pace of technology solutions that though price point has come down, the reliability of the solutions has gone way up," he said. "Historically, things that didn't work the first or second time just went into a drawer," he explained. "They are now much more reliable – and probably more important is that we're beginning to build the infrastructure. I think we are now at a wonderful inflection point of building engagement and adoption." From the view of large health systems, where many seniors will be seeking care in the years ahead, Chamberlain said that major advances in areas such as telestroke and tele-ICU have made those disciplines "effectively the standards of care." When it comes to those specialties, telehealth has "not only demonstrated significant clinical benefit, but dramatically changed the pathway for patients and provided enormous economic benefit." Meanwhile, "far and away the fastest growing area of telehealth is in the behavioral health and telepsych space." That's already serving a need, he said, for aging patients and younger ones too, across a broad continuum. "Whether it's emergency rooms, whether it is in wards, whether it is in outpatient based solutions, there is such a scarcity of access points to the providers," said Chamberlain. "The next generation of successful virtual companies will be those that understand the critical marriage between chronic care management, behavioral health and social determinants." Telehealth and virtual technologies, he said, "are really uniquely capable of addressing chronic illnesses because it can meet patients where they are. So I think we're seeing a increasing level of focus on how do we drive care and solutions to that subset of patients that are really driving the preponderance of cost." That's more complicated than just dealing with one such as diabetes, of course, it means "navigating multiple comorbidities and it's delivering a kit or a set of solutions that are easy to use and easy to implement. And that wasn't there five years ago, it wasn't there two years ago. But I think we're now beginning to see significant momentum in that." "Easy-to-use chronic care management tools are seeing a lot of uptake," said Chamberlain. "Whether it's cardiac management, whether it's respiratory help, or diabetes solutions across the board are being delivered with a level of consistency and ease of use that the senior population is beginning to take them up. And obviously the the benefit of tools like Alexa and other voice enabled solutions are really beginning to see an increase the adoption." In turn, that creates a "wonderful longitudinal ecosystem for them to deliver care," he said. "A lot of this just comes down to how do you improve adherence and compliance consistently, whether it is therapy or drug delivery. The solutions now are much easier to use and much easier to implement in these settings." In long-term care and skilled nursing facilities, meanwhile, more and more are "finally recognizing that you can use telehealth for after-hour coverage, for weekend and night coverage." Rather than being rushed to the hospital in an ambulance for acute care – a risky and expensive way of doing things, as many as 85 percent of nursing home patients are "now being treated in a place using telehealth," he said. "The other area that the post-acute and senior living space is benefiting from is in tele-behavioral health," said Chamberlain. "There is an enormous need for continued quality services for delivering telepsych and telebehavioral health more broadly – in the skilled nursing and assisted living sector, as well as in memory care." Chamberlain points to Avera Health's longstanding and well-respected Avera eCARE service, which "has built a real unique bunker in which they are navigating ICU, telepharmacy, telestroke," he said. "It's creating in a environment in which the participants can all be in a coordinated care model in which you will have subspecialists working with case workers working with behavioral health specialists." Mercy Virtual in St. Louis, meanwhile "has similarly built an infrastructure that is effectively a virtual hospital," he added. "Kaiser has been a huge proponent of delivering telehealth solutions across their continuum. And one of the most advanced examples probably is what Kristi Henderson has put together with Ascension GoodHealth in Austin, Texas – and now franchising outwardly to help navigate care to the right place at the right time for hospitals as well as senior living." 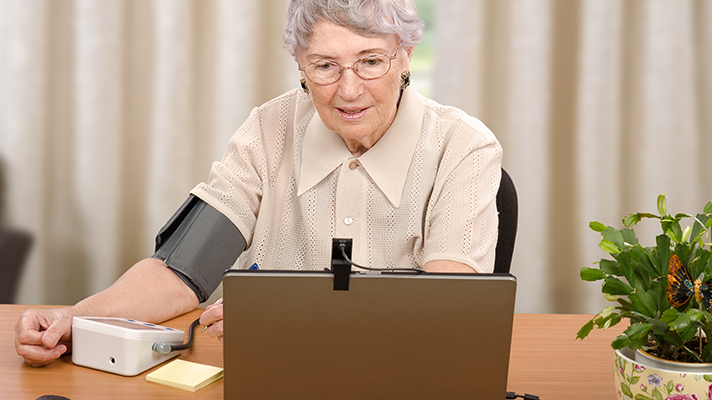 As the Baby Boomers age and put strain on U.S. health systems, ultimately the best-case is for telemedicine to facilitate "provider workforce optimization," said Chamberlain, "across the continuum of specialists, subspecialists, PCPs, physician assistants, nurse practitioners, case workers, social workers and family members. "If you have tools that drive the solutions to the right area, through the benefit of continually improving solutions embedded within existing workflows, telemedicine can drive timely evidence-based analytically-driven engagement to the appropriate providers that can really enable all of them to operate at the top their license," he explained. "Given the scarcity of clinical resources that are available – and certainly with the impending silver tsunami – we're going to need everybody managing and dealing with the preponderance of these chronic care elements in the most efficient possible way," said Chamberlain. "That's part of why I think telehealth is now building so much momentum."